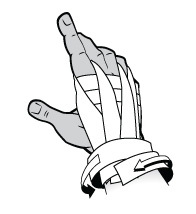 Place 3 strips of tape across the back of your hand, overlapping each strip by about ¼". Make sure the top strip covers your knuckles. Starting on the back of your wrist, run a strip of tape up, around the base of your index finger, and back down to your wrist. Bunch the tape together where it passes around your finger. Repeat for your pinkie. Make sure these vertical strips overlap the 3 horizontal strips from step #1 generously; there should be no gaps on the back of your hand. 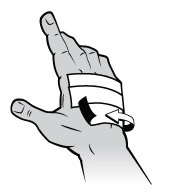 Anchor your tape job with several wraps around your wrist. 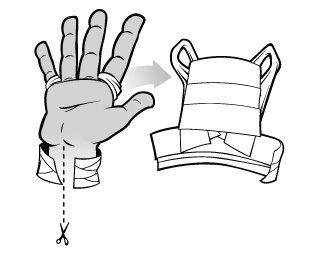 Now you have full protection on the back of your hand for jamming, but your palm is bare for grabbing face holds. The best of both worlds! 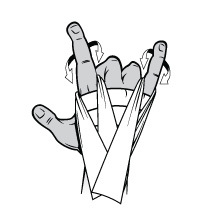 To remove, simply cut the wrist wraps on the inside of your wrist. Carefully pull the tape glove off intact. 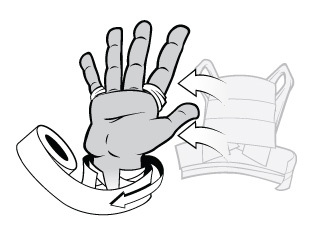 Save yourself some coin and re-use your glove. Just slip it back on and rewrap the wrist. You'll be amazed how long a well-made glove will last.